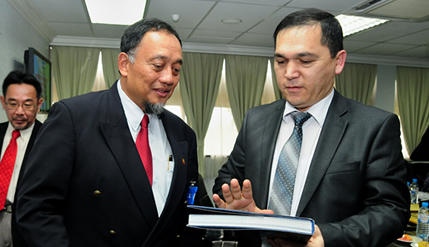 BANGI, 21 Jan 2014 – The National University of Malaysia (UKM) may set up Bahasa Melayu courses in universities of the Central Asian republic of Uzbekistan. The request came from Uzbekistan’s Deputy Minister of Higher and Secondary Special Education, Botir Usmanov while on a short visit to UKM today. Usmanov said universities in his country are interested in implementing various language courses in order to diversify their higher education programme. He said Uzbekistan is looking beyond Russian, English and other European languages because of the increasing importance of trade with South-East Asian nations. Usmanov led an eight-member delegation visiting UKM where they met Vice-Chancellor, Prof Datuk Dr Noor Azlan Ghazali and Deputy Vice-Chancellor (Academic and International Affairs) Prof Ir Riza Atiq Abdullah Rahmat. Usmanov was accompanied by the republic’s ambassador to Malaysia, Shukur Sabitov. In his welcoming address, Prof Noor Azlan predicted that education cooperation between the two nations would strengthen, particularly with UKM. Prof Ir Riza, in his briefing to the visiting delegation, gave a similar positive outlook on the possibility of UKM’s role in helping universities in Uzbekistan. Also present at the briefing were the Director of the Centre of International Relations, Prof Dr Imran Ho Abdullah, Dean of the Law Faculty, Prof Dato’ Dr Aishah Bidin and Deputy Dean of the Science and Technology Faculty, Prof Dr Maslina Darus. Malaysia and Uzbekistan had signed an inter-governmental memorandum of cooperation on education. Several universities in Uzbekistan, including Tashkent Medical Academy and Tashkent State Technical University had signed Memoranda of Understanding (MoU) with Universiti Malaysia Perlis recently. Malaysia and Uzbekistan established diplomatic relations in 1992 with Malaysia opening its embassy in Tashkent in 1993. Since 1992, the President of Uzbekistan, Islam Karimov has made several visits to Southeast Asian countries such as Malaysia and Indonesia which were part of his longest trip abroad. They are also developing ties in economic and investment cooperation, oil and gas and tourism. Uzbekistan with a population of 30 million is a land-locked country bordering Kazakhstan and the Aral Sea to the north and northwest, Turkmenistan to the southwest, Tajikistan to the southeast and Kyrgyzstan to the northeast. Uzbekistan is one of the largest Central Asian states and the only Central Asian state to border all the other four. Uzbekistan also shares a short border – less than 150 km – with Afghanistan to the south.